When faced with a need for quick cash between paychecks, Missouri residents need only to click on CashLoan.org from the comfort and convenience of their home computer and apply for a cash advance loan. The process is fast, easy, and confidential. Simply fill out the application and within 90 seconds you can be approved for a cash advance loan. After the approval, it only takes about an hour for the funds to be deposited into your account. Now that’s service! An emergency car repair, a medical emergency, a gift for that surprise birthday party or an unexpected financial loss are just some of the emergency financial problems that could surprise you between paychecks. CashLoan.org offers a quick and confidential service. Why struggle and juggle finances between paychecks when you can alleviate your financial headache in about an hour? Residents in most states can take advantage of this easy-to-use service. 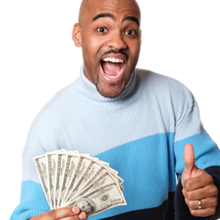 APPLY NOWonline for your cash advance loan at CashLoan.org or contact us today! Missouri has laws on the book that specifically target the authorization of cash advance loans. The legislation does not stipulate how many loans the borrower may have at a time. While civil action is allowed (in the form of collection fees and “reasonable” attorney and court costs), payday advance lenders may not pursue criminal action against a borrower. Loan terms vary- they can be anywhere from 14 to 31days. Missouri law permits six extensions or rollovers. Upon each rollover, however, the borrower must reduce the principle of the loan by at least 5%. Companies may charge any interest rate and fees that the consumer is willing to pay as long as the fees do not exceed 75%.